UPDATED: Sat., July 14, 2018, 3:23 p.m.
At Chicago Golf Club, Wheaton Ill.
WHEATON, Ill. – Laura Davies had an inkling something special might happen on Saturday when she hit a series of perfect 7-irons on the practice range after a morning rain softened Chicago Golf Club. The British golfer then seized a commanding five-shot lead over American Juli Inkster after three rounds of the first U.S. Senior Women’s Open with a 7-under-par round of 66. “It’s guaranteed myself a sleepless night now, which is probably not what you want,” Davies said. “I’m not saying I’d rather be tied for the lead, but you sleep a lot better when you’re tied for the lead. The pressure is a little less considering her low number Saturday for an 11-under 208 total. Davies birdied six holes, but took control with a 65-foot, twisting, downhill eagle putt on the par-5 12th hole. Davies’ long driving normally provides an edge, but the dried out greens and fairways had made shot placement difficult during the first two rounds. Then it rained Saturday morning. The series of solid shots at the practice range instilled confidence. Until Saturday, no player had scored in the 60s over 6,088-yard Chicago Golf Club, one of the original five clubs to found the United States Golf Association. Not only did Davies do it with a women’s course record, but Inkster moved into second with a 5-under 68. It included a 20-foot eagle putt at the 18th hole. “I kept grinding,” Inkster said. “You know, Laura is going to be tough because she hits a few wild ones but she seems to recover. But her iron game is really on point and she made a ton of putts today. 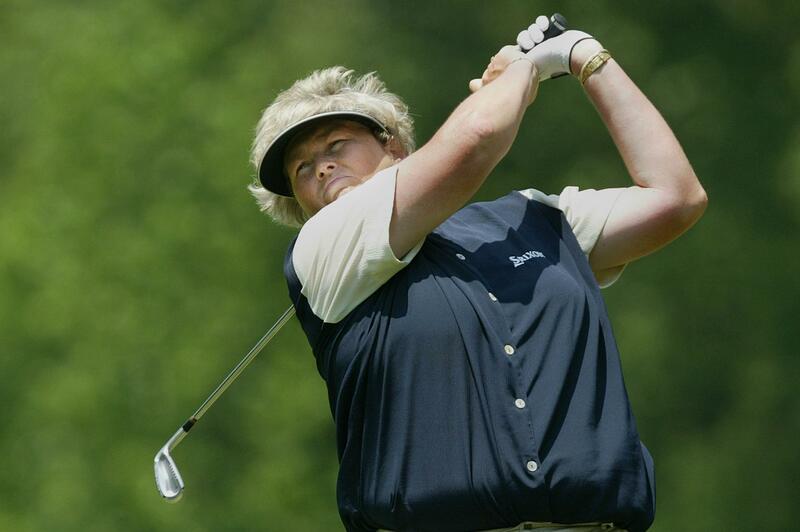 Inkster, who won the 2002 U.S. Women’s Open, thinks any chance to catch Davies will require perfection. After two rounds, Davies had been tied with fellow Brit Trish Johnson at 4-under 142. Johnson shot par Saturday and dropped seven back into third at 215. Danielle Ammaccapane is fourth at 1-under 217. Barb Mucha and Yuko Saito are fifth at 1-over 220. Davies, who is in the World Golf Hall of Fame, scoffed at the notion a victory on Sunday might help land her in the LPGA Hall of Fame. Inkster thinks she belongs in anyway, after 20 LPGA victories. Published: July 14, 2018, 2:26 p.m. Updated: July 14, 2018, 3:23 p.m.